This is an acrylic DVD or card rack which features tiered shelving to better organize your merchandise. 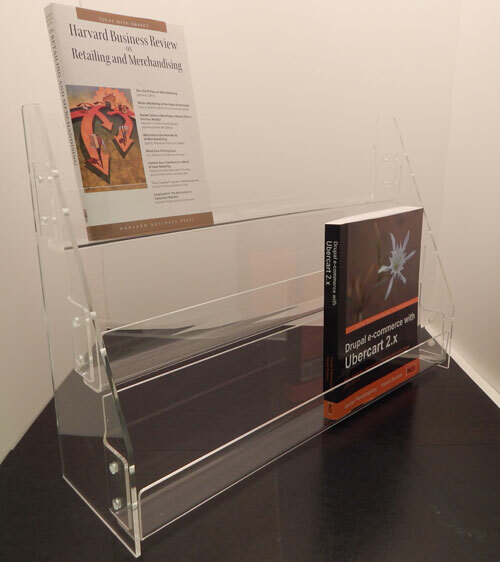 The clear acrylic construction is perfect for any retail space as it will not distract your customers from the items on display. We use only the highest quality acrylic for the construction of our displays to ensure the maximum durability. Flame polished edges help to give your display and clean and professional finish. We also carry mounting brackets for slatwall and gridwall. 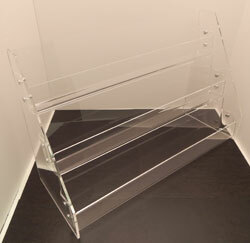 This CD and card rack is constructed of clear acrylic with 3 or 4 tiered, tilted shelves. Each shelf measures 21"w x 1 3/4"d. Easy assembly is required. Available for gridwall or countertop use. Choose from the shelf options below. This multi level acrylic tray rack has 3 tiers and comes with three trays. Trays come with 1, 2, 3, 4, or 5 compartments and measure 16"w x 4"d x 3"h. Also available for slatwall or gridwall display. These acrylic trays are available with single, 2, 3, 4, or 5 compartments. All trays are 16"w x 4"d x 3"h, and are available for slatwall or gridwall display.